These tips are in no particular order, and I’ll add more as time goes on. If you have a specific request, feel free to comment below with your question. 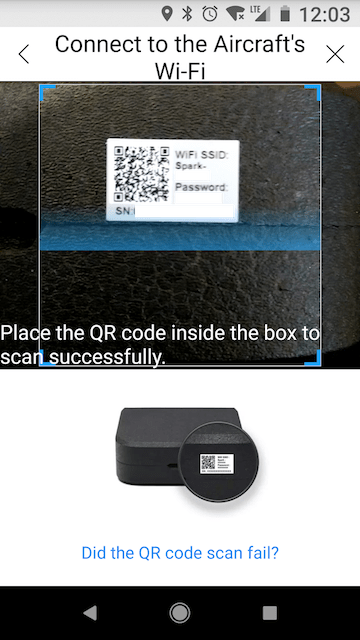 The DJI Spark Drone QR Code is found on the styrofoam drone case or on the actual aircraft battery compartment (before you connect the battery). Scanning Problems? On my phone, I’ve found that it is usually an issue with the QR code being out of focus. Try moving closer to the QR code, moving further away until in focus and then moving close in again. 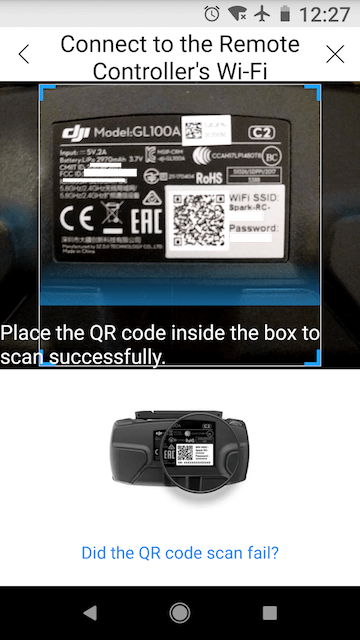 If your phone successfully scans the QR code, your DJI Go 4 app on your phone will beep and you will have a message that says “Connecting to the device…”. If you’ve followed all other steps correctly, the DJI Go 4 app should then successfully connect to the Spark. DJI Spark QR Code Not Working? If you are able to scan the QR code, but nothing happens, it is likely you haven’t turned on the drone’s Wi-Fi. Do this by pressing the function button at the rear of the aircraft for 6 seconds until the aircraft beeps twice. The function button is on the battery beneath the 4 green lights. Hold the function button and it will first beep once while the green lights above it flash. Then it will beep twice indicating the Spark’s wifi is on and ready to connect with your phone. NOTE: You may need to put your phone in Airplane mode first, then click on your WiFi icon before you will be able to connect. If you still have problems you can connect to your Spark’s WiFi manually by selecting it from your saved Wifi connection list (assuming you were able to connect to it in the past). Or, you can enter the aircraft’s WiFi SSID and password that is also found on the QR code sticker. (see sample photo). Confused yet? Don’t worry, you’ll get the hang of this soon. If you’re having problems scanning the QR code for your DJI remote, it is usually the same problem as the aircraft. You’re either too close or too far away, or the lighting is bad. Be patient, keep adjusting distance and you should be able to connect. The most likely reason you cannot connect to the RC is that you may have not turned it on. To turn on the RC, click the power button once, then hold it again until the remote control beeps and the power lights come on. Be sure you have put your phone in Airplane mode, then hit your WiFi icon on your phone so it can connect to the remote control’s WiFi signal. If you have already connected in the past, your phone may automatically connect. If this is your first time, you can find the SSID and password for your remote control on the back. If you seem to be doing everything correctly, but still having problems, you may need to completely exit out of the DJI Go 4 app, power down the remote and the drone and start from the beginning. To be honest, sometimes it just takes a bit of trial and error and there’s no real logical explanation for connection issues. 1 – Didn’t put the phone in Airplane mode and enable WiFi after entering Airplane mode. 4 – QR code too close or too far away from the camera while scanning, or lighting is poor. 5 – Phone may be automatically connected to another WiFi signal you have saved on your phone or iPad Mini. 6 – Bluetooth interference. Disable, but Airplane mode should do that for you. By the way, it’s a good idea to take a photo of both of your QR codes in the case for some reason you lose it or they get damaged. For detailed notes on troubleshooting connection problems with your phone and your DJI Spark with or without the remote (Aircraft Combo), please see our article “How to Connect a DJI Spark with Google Pixel XL“. Did you know the DJI Spark Intelligent Flight Batteries have firmware? Yes, it’s true. I guess that’s why they are called “intelligent”. Here’s a video tutorial on how to update the battery firmware. Be sure that your batteries have been charged to at least 50% (preferably fully charged) and do this at home so you don’t have to update in the field. Also, do not turn off either device’s power or exit the app during the update. Another option for updating firmware is to use the DJI Assistant 2 app for your PC or Mac. This is a great option as you will likely have a better Internet connection and you won’t run the risk of bricking your remote controller. I’ve heard of this happening before, but not sure how common. better than WiFi. I’m still fairly new at this and guess the main advantage of OTG is for a better/faster video signal when flying. I’ve also read that OTG allows the Spark to fly further. I’ve also read that you need to install version 4.1.15 on Android or you won’t get telemetry data. 7 – Click “Go Fly” and have fun! This article isn’t something I can get to read on most blogs! This is a really helpful piece, thanks for sharing. Great insight on the tips and tricks here, I appreciate it! Great help for a new drone user! Glad to have read your post! it really helped me a lot with my Spark drone. Wow great tips thanks a lot for this very informative for a beginner like me.